There are over 25,000 species of orchids in the world, and more than 105,000 manmade hybrids as well. The number continues to increase as new species are discovered and new hybrids are developed. Orchidaceae is the largest and most diverse family of flowering plants (Angiospermae). Botanists consider orchids to be among the most advanced floral evolution known, because of their symbiosis with mycorrhizal fungi and their interactions with pollinators. 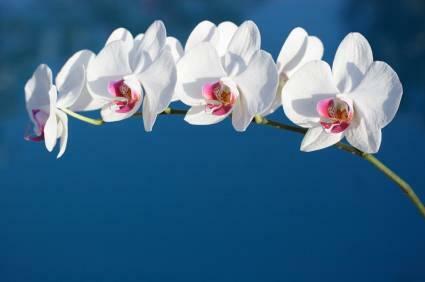 Some orchids are shaped so that only one species of insect can reach the pollen, while others are pollinated by birds. Orchids are found worldwide. Some are terrestrial, many are epiphytes, and a few are lithophytes. Terrestrial. These orchids grow rooted in the soil, especially in leaf compost on the forest floor. Some species are rhizomatous, forming corms or tubers to store food and water. Terrestrials are mostly found in cool climates. Epiphytes. These plants use trees for support and do not require soil. They normally grow in warm regions. 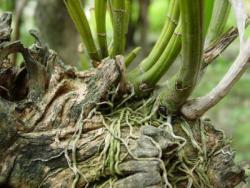 They have modified aerial roots covered with a spongy, water-absorbent surface called velamen. These silver-gray or white roots can be ten feet long, to help them absorb more moisture. In species that have no leaves, the roots also contain chlorophyll. Lithophytes. A few species are lithophytes, growing in and on rocks. They feed off litter, moss, nutrients in rainwater, and sometimes even their own dead tissue. All species rely on mycorrhizal associations with various basidiomyceteous fungi to reproduce. Some species lack chlorophyll and depend entirely on these fungi for their nutrients. 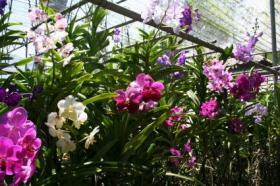 The key to growing orchids successfully is to reproduce the conditions of their natural habitats. Because there are so many species, and they grow under very different conditions, this can be a complicated project!In general, domestic orchids are grown in soil less mediums. Sometimes they are grown clinging to bits of wood or wire supports. Nutrients are supplied with a range of liquid fertilizers, applied in dilute solutions. Light exposure, temperature, and humidity levels are carefully controlled. Often, hobby growers end up building greenhouses for their collection! Two genera are readily adaptable to being grown as houseplants. Paphiopedilum is a genus containing about 77 species native to South China, India, Southeast Asia and the Pacific Islands. The name is derived from the Greek city Paphos and the word 'pedilon', or slipper. They are often called 'Slipper' or 'Lady's Slipper' orchids because of the pouch-shaped labellum of the flower. The pouch traps insects so that they are forced to climb up past the staminode, where they can collect or deposit pollen.The American Orchid Society gives information on growing paphiopedilums here. Phalaenopsis is a genus of containing about 60 species. The name comes from the Greek words 'phalaina' moth and 'opsis' like. They are often called Moth Orchids, because a cluster of blossoms on a flower spike resemble a group of moths in flight. A few phalaenopsis are lithophytes, but most are epiphytic shade plants. A healthy plant produces one or two thick, fleshy leaves each year, and the oldest leaves drop off. They do not produce pseudobulbs. The blooms can last as long as three months. Phalaenopsis also have a unique photosynthetic mechanism. In most plants, the flower petals wilt and disintegrate after the plant is pollinated. Phalaenopsis petals turn green, become fleshier, and photosynthesize. The AOS provides information on growing phalaenopsis at Orchid Web.org.